Building paper chromosomes to help understand five key terms in genetics. In this easy to implement lesson, the author shows how to teach students the rules of base pairing as well as chromosome structure. By using a variety of instructional techniques and student pairings, high schoolers learn the relationships among five important genetic terms--allele, chromosome, gene, genome, and locus. In my experience, I have found that high school learners struggle with the exact relationships among these terms. This hands-on lesson allows students to walk away with a rich understanding of the meaning of each of these terms. 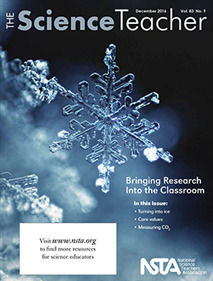 The author also does an excellent job showing the specific NGSS connections to the classroom activity.